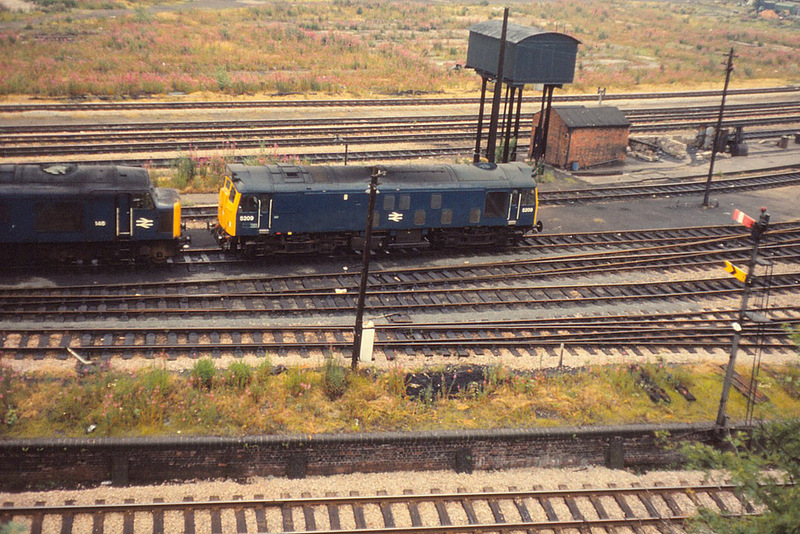 The class 25 locomotives, which were an upgraded version of the earlier class 24 diesel locomotives, were built for BR. The locomotives were built at the British Railways workshops at Derby, Crewe and Darlington and by Beyer Peacock Ltd. The class 25's were divided into sub classes with twenty-five (25) locomotives of class 25/0 (Nos.D5151 to D5175 later Nos.25001 to 25025), fifty-seven class 25/1 locomotives (Nos.D5176 to D5232 later Nos.25026 to 25082), ninety-seven class 25/2 locomotives (Nos.D5233 to D5299 and D7568 to D7599, later Nos.25083 to 25149 and Nos.25218 to 25247) and one hundred and forty-eight (148) of class 25/3 (Nos.D7500 to D7567 and D7598 to D7677 (later Nos.25150 to 25217 and Nos.25248 to 25327). Locomotives of class 25/0 operated in Worcestershire but we have no photographs to illustrate this section. The 25/0s had a similar body style to the later class 24's but the engine was up-rated to 1,250hp with a top speed of 90 miles per hour. They were intended to be used on freight services and had no heating boilers. 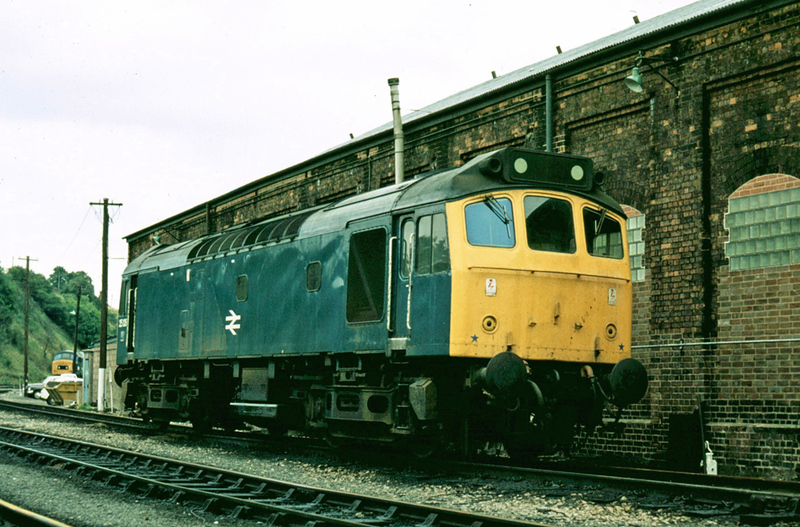 The class 25/1's featured design detail and design differences from the class 25/1's the most prominent of which was the relocation of the air horns to either side of the headcode panel. 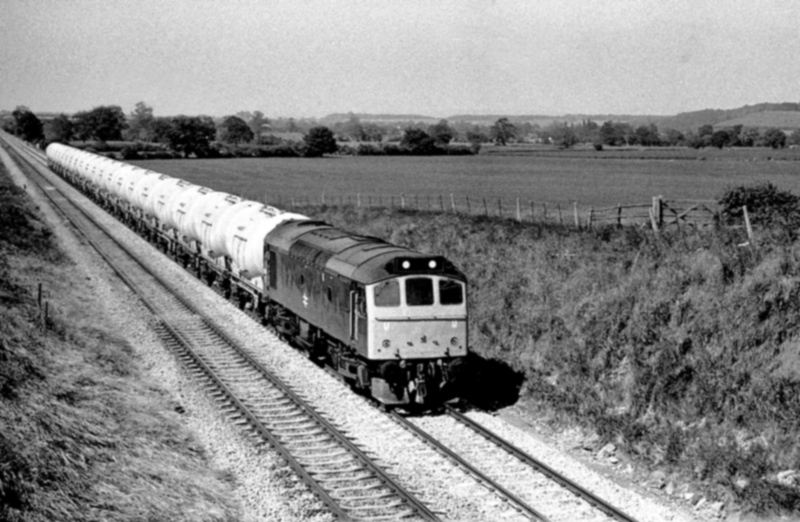 On 17th June 1978 class 25/1 diesel locomotive No.25097 has charge of a southbound tank train at Bredicot on the former Birmingham and Gloucester Railway. It is worth noting that the air horns were fitted in circular housings on either side of the headcode panel. 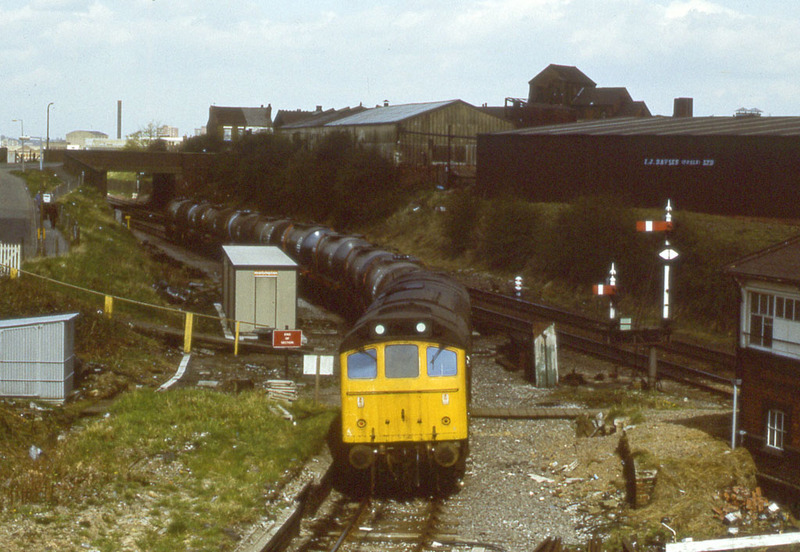 From the early 1970s Pete Wilcox has supplied photographs of two examples of class 25/1 locomotives before the re-numbering scheme had been introduced. 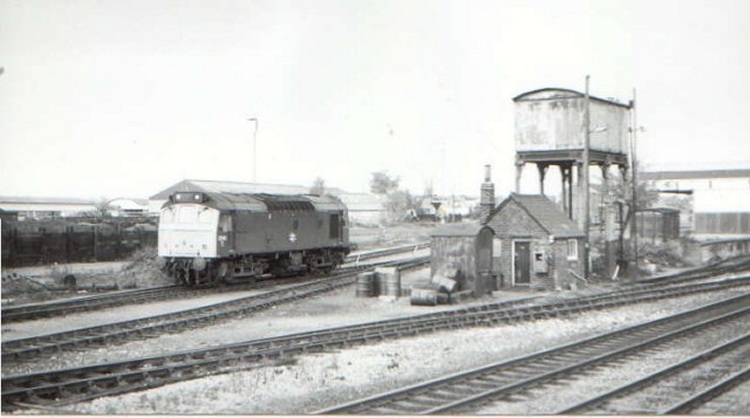 The first photograph shows No.D5209 standing in the shed yard at Worcester on 2nd August 1972 ('Peak' class 45 No.D146 is alongside) with the wasteland of the former wagon works and diesel shed in the background. The lower photograph shows No.D5209 on a northbound parcels train at Worcester on 5th February 1973. Interestingly No.D5209 has two BR symbols on the side of the locomotive whereas No.D5184 has got one symbol located in the middle. 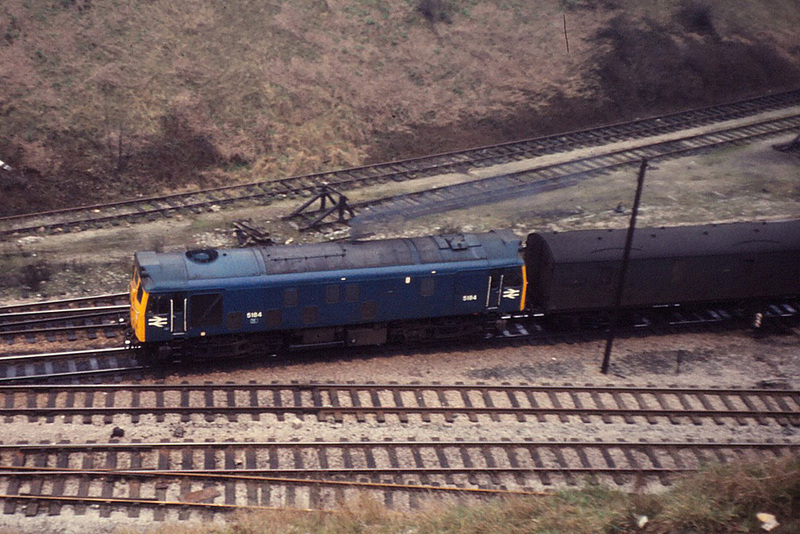 Some of the locomotives of class 25/2 (Nos.D5233 to D5299) featured a new layout of body panels whilst the others of the class used the earlier styling. The class 25/2's also had many detailed design differences for the class 25/1's. In August 1978 Keith Riley photographed class 25/2 No.25126 stabled alongside the diesel shed at Worcester depot. All of the class 25/3 locomotives has the revised body styling as on the later class 25/2's. In addition the electric were upgraded with a form of electronic control system. The locomotives with the revised body styling were initially delivered in two-tone green livery but the last eighteen (Nos.D7660 to D7667) were delivered in rail blue livery. 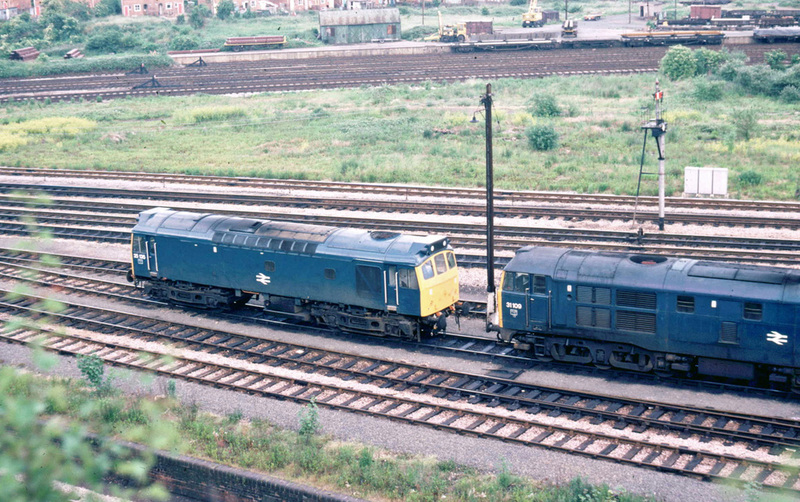 On 8th June 1978 Keith Riley was at Worcester Shrub Hill Station where he took this photograph of a pair of class 25 diesel locomotives. The leading locomotive is class 25/3 No.25305 with No.25221 coupled inside. 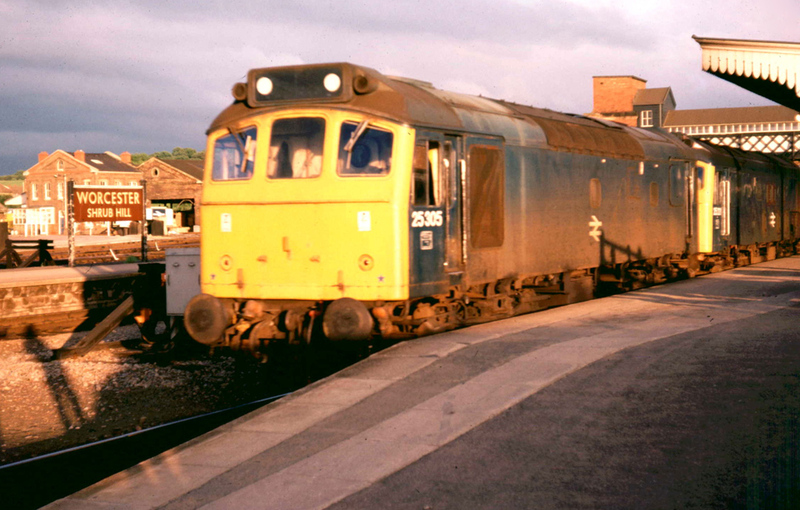 Class 25/2 diesel locomotive No.25190 was photographed in the goods yard at Kidderminster before the site was taken over by the Severn Valley Railway. Photograph taken by Adrian Booth. (This photograph was previously on the page for Kidderminster Station).